Late Blight Phytophthora infestans, has been confirmed on potatoes and tomatoes in Wisconsin every year since 2009. As I write this, July 9th late blight has been reported in 3 central Wisconsin counties. Late blight caused the Irish potato famine of the 1850’s. It is often referred to as a ‘community disease’ because it is extremely destructive and easily spread by wind. Left unmanaged, a small outbreak can lead to an epidemic, devastating gardens and commercial vegetable fields. This disease has the potential to completely defoliate fields within 3 weeks of the first visible infections. Spores are easily spread by wind, rain, machinery, workers, and wildlife. Because the fungus produces so many spores that can travel long distances through the air it is very important that everyone, farmers and gardeners alike, who grow potatoes and tomatoes are able to identify late blight. Know the Symptoms: Leaf symptoms appear as pale green, water-soaked spots that often begin at the leaf edges or tips where water from rain and dew accumulates. Spots can be circular or irregular and bordered by pale yellow to green blending into healthy tissue. They enlarge rapidly (expanding ¼ to ½ inch per day) turning brown to black over time. When relative humidity is in excess of 90% leaf lesions are often surrounded by cottony white mold on the lower leaf surface. This white, cottony growth distinguishes late blight from several other foliar diseases of potatoes and tomatoes. Infected stems and petioles turn brown to black and may also be covered with white masses of sporangia. Stem lesions frequently appear first at the junction between the stem and leaf, or at the cluster of leaves at the top of the stem. Entire vines may be killed very rapidly. A characteristic odor similar to that produced by green tissue after a severe frost can often be detected. Visit the University of Wisconsin Vegetable Pathology website http://www.plantpath.wisc.edu/wivegdis/index.htm and the UW-Extension Horticulture website http://hort.uwex.edu/articles/late-blight/ for additional late blight photos and links to other late blight information including options for gardeners and organic producers. Get Disease Confirmation: Twice weekly check potatoes and tomatoes closely for symptoms of late blight. If you suspect late blight on your crop contact your local University of Wisconsin Extension office http://counties.uwex.edu/ and have a sample sent to the University of Wisconsin plant disease diagnostic lab for confirmation. If confirmed, destroy infected plants by burying or putting in plastic bags for disposal. Don’t compost!!! Late Blight Look-Alikes: Early Blight – appears as brown to black lesions with concentric rings on the leaves. Typically, lesions are produced on older, lower leaves and progresses upward. Significant yellowing may accompany the lesions. Moderate temperatures (75 to 85 oF), high humidity, and prolonged leaf wetness are conducive to development of early blight. Alternating periods of wet and dry weather tend to increase progression of this disease. 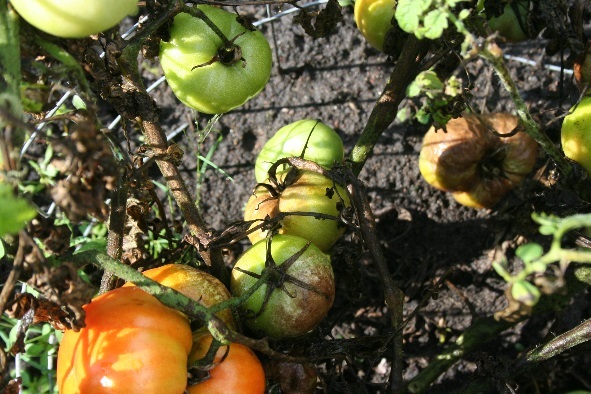 See UW-Extension Early Blight fact sheet http://labs.russell.wisc.edu/pddc/files/Fact_Sheets/FC_PDF/Early_Blight.pdf . Botrytis/Gray Mold – Gray mold appears late in the season on the foliage, and may be mistaken for late blight. A grayish-green, wedge-shaped, spreading lesion with concentric rings appears on the leaves, often near an injury or a dried blossom. Lesions begin on the margins or tips of leaves. With severe infections, leaves are blighted and a soft gray rot attacks the stems and exhibits a fuzzy gray fungal growth. When vines are disturbed, spores billow from them like a cloud of dust. Cool temperatures and high humidity promote disease development. Gray mold is often found in fields where a lot of fertilizer is used. Typically, gray mold is not of economic importance in Wisconsin. See Gray Mold fact sheet http://labs.russell.wisc.edu/pddc/files/Fact_Sheets/FC_PDF/Gray_Mold_Botrytis_Blight.pdf . Septoria Leaf Spot – A very common leaf disease of tomato, however, not necessarily a look-alike. Symptoms begin on the foliage closest to the ground and then move on up the plant. Leaf spots tend to be small and circular with dark borders and gray or tan centers. Eventually, multiple spots on a single leaf will merge. Warm, wet, humid weather increases the severity of the disease that can progress to the point where all the foliage is killed and falls from the plant. This disease does not advance nearly as rapid as late blight. See UW-Extension Septoria Leaf Spot fact sheet http://labs.russell.wisc.edu/pddc/files/Fact_Sheets/FC_PDF/Septoria_Leaf_Spot.pdf .